OTTENS - Drentia comitatus transisulaniae tabula II. . .
OTTENS, R. / J. - Drentia comitatus transisulaniae tabula II. . .
Drentia comitatus transisulaniae tabula II. . . - OTTENS, R. / J. Title : Drentia comitatus transisulaniae tabula II. . .. Size : 21.1 x 34.1 inches. / 53.7 x 86.5 cm. 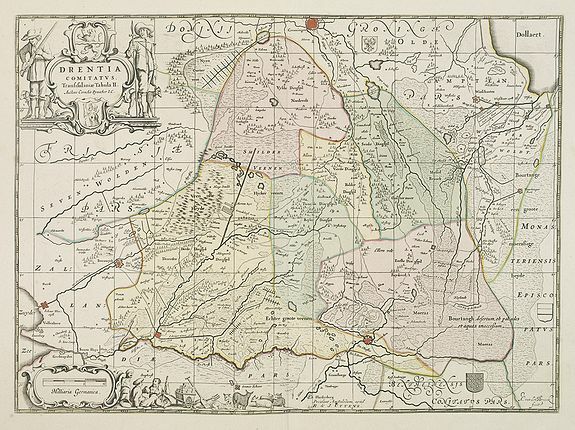 Description :A map of Drente and part of Overijssel. The surveyor of this map is Cornelus Pynacker who made his survey in 1634, and the map was engraved by A. van den Broeck. This is the rare re-issue by Reinier and Joachim Ottens. The copper plate was before used by Schenk and Valck. Showing Groningen, Steenwyck and Winschooten. Also the eastern portion of the Zuyder Zee. Joachim Ottens (1663 - 1719) and his sons Renier and Joshua were prominent Dutch booksellers and map publishers from about 1680 to 1790. Joachim, the founder of the firm, was initially employed as a copperplate engraver by Frederick de Wit. In 1711 Joachim founded his own firm. Though Joachim died only a few years later, his sons Renier and Joshua took over the firm and presided over its most prolific period.